The thing that sold it for me was how she looked away, pretending not to stare at him, then took a quick glance back again, before avoiding eye contact. The entire time it seemed like she was holding her breath, like she forgot how to breathe. All of this! Agreed 100%. Classic girl code: look long enough to acknowledge the hotness, then look away so he doesn't catch you staring! Yup! That's exactly what a person does when they're checking someone out and don't want to get caught. This is exactly why the "well I didn't see anything" comments about how she look at him don't exactly fly. It's very much trying to look at him without getting caught doing it. It's far more subtle versus the 3 exact times he gives her elevator eyes. The thing that caught my eye and made me picking Reylo at my first viewing was Kylo demasking in front of Rey. @ISeeAnIsland - I believe that was @MeadowofAshes' observation! And he's supposed to be all business, but having a hard time staying on task because he's immediately interested in her. She definitely gets the Gold Star treatment versus Poe's experience. I'm not completely convinced that she checks him out, either. I think she was surprised and maybe even confused that he wasn't a "monster". And somewhere in the back of her mind she might have even registered that he was good looking. But even that I'm not sure about, because even though he is very good looking, in her situation, being restrained like that, having no idea what he was going to do to her, would she really be checking him out and thinking, "Oh, he's hot"? If anything she was probably just really scared. Glad people noticed Rey's elevator eyes and not Kylo's which is was more noticeable and his attraction towards Rey. As people here said it was not only to show us Kylo's unmasking basically as Rey's POV but also from our to see he's not a monster. It's symbolic that he unmasked himself in front of her. A lot of people were asking why he did not do it for Han his father, I see perhaps this will serve for movies forward and JJ said their interrogation scene will have impact further forward on them and plot. She checked him out like girl is doing with a boy that she's not supposed to be attracted to. She looked at him as he put his mask, then quickly turned away from so he wouldn't noticed it, then quick turn at him. Rey is attracted to him and he is to her, probably more so and her attraction is more subtle than his. Also not to mention Force bond possilibity. The interrogation scene is one of the most important scenes of the movie. Kylo and Snoke talk about the "awakening", but we first see it in action in this scene, when Rey reverses his mind probe. It makes sense that Kylo removes his mask there, it's a turning point for the story. After he meets Rey, he spends most of his screentime without his mask. I've been deliberating what to contribute to this thread for a while now and I think I've finally come up with something. Recently I've spent a little time re-watching Kodomo no Omocha (Child's Toy), and IMO it's a perfect example of just why the very unique character dynamic that is likely to evolve between Rey and Kylo is considered "for the ages"; no matter the plot, no matter the subject matter, no matter the genre, target audience or setting, this particular character dynamic is absolutely one that is bound to go down in history every single time it's written extremely effectively. Everybody can relate to the desire to complete and want to be completed by another person, and when writers take that a step further you end up with something truly special. I picked this series as my example because it really couldn't be further from SW, and that's exactly what I wanted (I thought about what to use for a while). It's essentially a children's romantic comedy, a really simple anime/manga about a grade school rivalry between an upbeat girl and her sixth grade class' seemingly emotionless bully. Not what you might call an "epic" story on the outside, but I found it to be strangely engaging as a romance between kids. The writer uses a lot of bizarre symbolism to emphasize the wackiness that goes in inside a young girl's mind, so everything is very exaggerated (i.e., Akito isn't just the class bully, he's a little demon to the protagonist). As such, their friendship/relationship starts in a bad place (with Sana insulting Akito and Akito physically and psychologically targeting her). Of course, after seeing Akito's home life and getting to know him a little Sana becomes compassionate toward him, and he gradually (and secretly) falls head-over-heels for her, but has a lot of trouble separating himself from the "bully" persona he adopted for so long. The series mainly revolves around Akito and Sana helping the other kids and adults in their lives, with the protagonist and deuteragonist making the perfect duo because each possesses what the other lacks. I think it's this idea that truly attracts people, because this kind of dynamic seems to transcend all ages and genres. When many of us think of great romantic stories, elementary school flings typically don't come to mind. 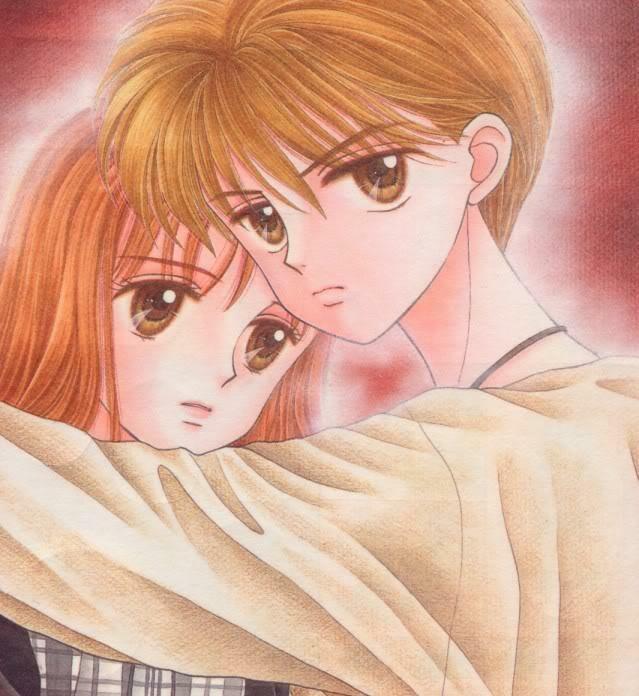 However, the relationship between Sana Kurata and Akito Hayama—i.e., the heart of Kodomo no Omocha—truly is an anime romance for the ages. Famous television actress and kinetic ball of energy Sana initially seems like a terrible match for sullen and morose class troublemaker Hayama. After Hayama succeeds in plunging their class into chaos, Sana does the unthinkable by taking a very public stand against the school's resident problem child. Despite Hayama's best efforts at retaliation, Sana vehemently refuses to indulge the young upstart's behavior. (At one point, she even pulls his pants down and snaps a blackmail photo—oh, the horrible crimes committed by 11-year-olds in this show.) Although he's only a child, Hayama expresses a few characteristics of a Byronic hero—the kind of male lead that isn't conducive to a real life happily-ever-after but has always appealed to me in fiction. He's sullen and stoic, and his rock-hard exterior hides a rather dark past. Ultimately, the relentlessly optimistic Sana is the only one who's able to pull him out of his personal darkness, and before long, he comes to genuinely care for her. (It's quite a while before she's able to reciprocate these feelings.) The Byronic hero and the no-nonsense heroine is one of my favorite fictional pairings, so it makes sense that I always looked fondly on Akito and Sana's union. [Sana's] optimism is so contagious that even the perpetually downtrodden Akito can't help but be enveloped by it. When the time comes for Sana to confront her own demons, her once-time enemy proves to be the perfect rock. If you can't see the similarities to every single "Reylo" meta, well, I'm not sure you've read any. In short it doesn't matter if it's in a children's comic series or a space fairytale. A relationship that revolves around two characters completing each other is never going to go out of style. Never, ever. And that's why Rey and Kylo have the potential to be a romance for the ages. Still, it does give us slight concern that he’s basically a one-man walking support network for the accident-prone Skywalker family. And where does it get him, really? He’s forced almost to kill his best friend (who is, let’s face it, kind of a d**** anyway). He’s left to shuffle around a desert for two decades as a glorified long-distance babysitter. Then, as soon as his life starts getting interesting again, he’s unceremoniously knocked off by said best friend and forced to spend the remainder of eternity as a ghost in the company of the guy who killed him! Now that’s loyalty. I definitely noticed the romantic tension right away in the film. That's why I thought immediately that Rey was not related to him, and was in fact a Kenobi or a Palpatine. But whether it could actually turn into a relationship? I mean, I think if it does, it would be a doomed one, that they would have to sacrifice for the good of the galaxy. But what would it take to get there? I mean, Rey might be attracted to Kylo, but she also bonded with Han and Chewie, and she saw Kylo strike Han down in cold blood. So I think, what it would take is for there to be some sort of revelation about Han - If we found out that Han Solo actually did something very selfish, very bad, that pretty much ruined his relationship with his mother and made his son hate him - for good reason - well, then Kylo's murder of Han becomes at least something that's possible to overcome. I think that's the key to any redemption of Kylo Ren - learning about a fall to his hurtful, scoundrel ways. Who knows, maybe Han even had something to do with abandoning Rey on Jakku. Maybe he was paid to do it - maybe he got into serious trouble double crossing people (we actually see this in TFA) and kidnapping and abandoning Rey (or killing her parents) was the only way for him to get out of it. I seriously doubt they'd throw Han under the bus to make Kylo look better. If anything that would just make the fans angry. @Saracene wrote: I seriously doubt they'd throw Han under the bus to make Kylo look better. If anything that would just make the fans angry. I agree. Assuming that we get a Kylo redemption and romantic, mutual Reylo, we'll get some sort of twist that gives Ben's fall a sympathetic (or at least understandable) backstory. If the audience can understand why he did what he did (even if they don't completely agree with it), it'll make it easier to sell him as a potential redeemed hero. @fuhry wrote: I definitely noticed the romantic tension right away in the film. That's why I thought immediately that Rey was not related to him, and was in fact a Kenobi or a Palpatine. But whether it could actually turn into a relationship? I mean, I think if it does, it would be a doomed one, that they would have to sacrifice for the good of the galaxy. That would be really heartbreaking for me, if he was "responsible" for Rey's backstory. And everybody knows Han isn't Mr. Perfect and did some crazy things in his life and made misstakes. There are better ways of telling Rey's backstory when we have this big bad evil thing called Snoke. Yes I can't imagine they would make Han look that bad. I think it will be that plus another specific incident with Han. There are hints in the novelizations that Han is guilty about something, and that "I've been waiting for you for a long time" could fit in with that. IOW, I think Han will have something to be guilty for, but it won't be something to do with Rey (he didn't recognize her), nor will it be something that "ruins" him. It will be something tragic like him abandoning Ben when he needed him the most due to fear or just not paying attention. Like if Snoke has played the predator as long as we think he has, then Han missed something. That would caused significant guilt. Also, we have talked about a specific abandonment incident before ... I always wonder if han had some kind of contact around the time Ben turned and he ignored him or rejected and refused to help him if it was post-Jedi incident and Ben was half out of his mind. I am trying to remember if there was a point in the script where Han wanted to tell Leia something at the last meeting, but decided to wait to his return, or was that just in the novelization? I know that the incident you're talking about was in the novelization, but I'm not aware if it was ever in the script. I wouldn't be surprised if it was in the script--we know that from the BTS extra that there was an extended version of that conversation between Han and Leia at one point. And I'm totally with you that I expect there to have been a more concrete incident of "abandonment" beyond Han and Leia simply not seeing or being in denial about what was going on with Snoke and being too absorbed in their personal goals. I wouldn't be surprised if there was some last-ditch attempt by Ben to reach out to his parents or to Han or something after the Jedi temple incident. It would fit with what we know.